Follow the White Bunny: A small giveaway to celebrate! A small giveaway to celebrate! Well guess who turned three this month? 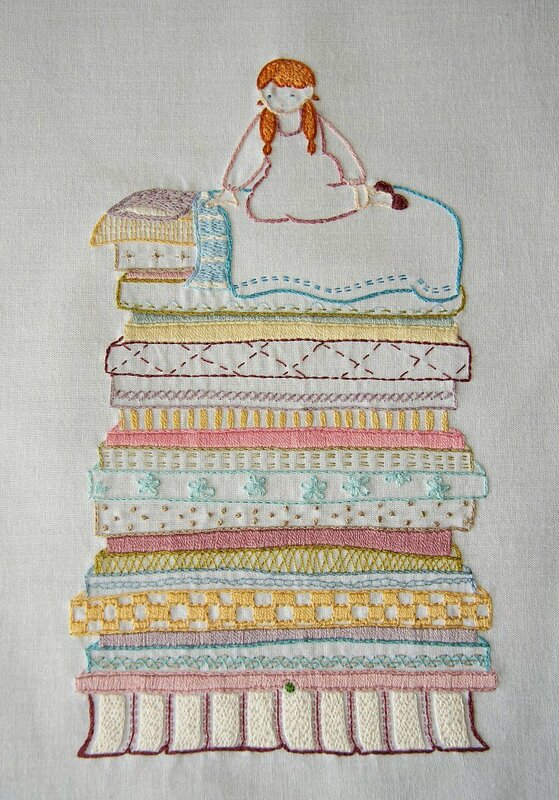 My Princess and the Pea pattern! I sold my first copy of this pattern on the 19th of March 2009 and I am happy (and grateful) that I have sold quite a few more patterns after that. Part of the success must be the lovely example piece my embroidery pal Georgia made of this pattern! We never met 'in person' because I live in the Netherlands and Georgia lives in Australia but it shows how through internet friendships (and long distance collaborations) lovely things can be made! I'm giving away three Princess and the Pea PDF Hand embroidery patterns (or if you already have one, one of my other patterns of your choice) to three lucky blog readers! You don't have to jump through hoops to enter, just leave a comment (a nice one preferably) and tell me your favourite (fairy)tale! Giveaway ends this Sunday 12 a.m. Amsterdam time. 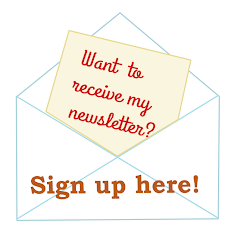 Be sure to check back to find out if you have won or leave an email address so I can find you. If I can't find you I will have to re-draw. Giveaway has ended, winners will be announced later today! Ooh I love this pattern! When I was little I had a book that was basically an encyclopedia of fairy and folk tales - I can't pick a favorite, they were all great! Although, The Red Shoes does stick out in my mind. Kind of morbid, but still entertaining. I think my favourite fairy story is the little mermaid. Though may more the Disney version as it's less sad! I love that pattern! So cute! Great Pattern! Love the red hair. Chicken Little is my favorite fairy tale. I can't tell you why, but I just love it! Thanks so much for the giveaway ~ I love your designs! Sleeping beauty has always been one of my favorites! thanks for the giveaway, and congrats on the anniversary. I always liked Goldilocks. I love the original Grimm's Fairy Tales. The fact that the stories have been softened and changed over time is really interesting. My favorites have always been Grimm's tales of Little Briar Rose and Snow-White and Rose-Red. My favourite always was (and still is!) the Princess and the pea! That is gorgeous. I've always liked the Princess on the Pea but my favourite was always the Princess and the Frog. Love this pattern and Snow White and the Seven Dwarfs. Vandaag je blog ontdekt via Sarah Fielke, ziet er allemaal erg leuk uit! En zo'n geweldig patroon wil ik wel winnen..
Love the pattern. I would love to win. This pattern is so adorable. My favorite fairy tale is Little Red Riding Hood. lisanoteboom (at) gmail (dot) com. I loved Rapunzel and Thumberlina, still do. Thanks for the giveaway and congrats on the milestone. We love Jack the Giant Killer - who lived on ST Michael's Mount in Cornwall. I love this pattern! I have been oogling it for 3 years now! Eep! I've loved this pattern for a while but never gotten around to buying it! My favorite fairy tales (more than one! I know!!) have always been 'The Nightengale' and 'Rose White and Rose Red'. My mother had this huge, red cloth bound book of just tons of fairytales and every night, I got to pick a different one. I always came back to those two. <3!! My favourite fairy takes are the Nightingale and the Tin Solider. I used to have this video as a kid that had then both on it. I watched it so much the tape broke. Your never to old to imagine and dream. I have always loved the story of Snow White! Because of Georgia's beautiful sample, I bought your Princess and the Pea pattern about 2 years ago and made one for my daughter's room. Best embroidery pattern ever! I can't believe she's 3! It really doesn't seem so long ago. I always loved Rapunzel and also Snow White. I love The Shoemaker's Elves! your pattern is adorable - thanks for the lovely giveaway. Growing up, the Three Billy Goats Gruff was my all-time favorite! Beauty and the Beast was up there too :) thanks for the giveaway! I just adore this pattern, and, if I win, will sew it for my niece for her first birthday. My favorite fairy tale is Rapunzel. It was just a bit creepy, but also romantic and I liked the mix! This is such an iconic pattern. Right now I love the Three Little Pigs. I really like Sleeping Beauty. What a darling pattern! Congratulations on your pattern turning three! Hmm I'm not sure if I have a favorite. I remember my Mom telling us 'The 3 Bears' and using all different voices for the bears. That's it. Thanks for bringing back a great memory! Isn't it amazing how quickly time goes by? Your princess is beautiful & I'd love to try the pattern someday. I think my favorite fairy tale was Snow White. Reading through the comments is making me want to go read a bunch of fairy tales! I love your Princess and the Pea pattern - she will continue to be a favorite for many people for years to come. My favorite fairytale is Rumpelstiltskin, I always wondered what might happen if I managed to guess his name myself - hours of fun! Congratulations! I love love fairy tales per se and I love love love the old Russian, Czech, and GDR fairy tale movies for children. Therefore it's hard to really pick a favourite. Film-wise, my all time favourite is the 1973 Czechoslovak-GDR coproduction "Drei Haselnüsse für Aschenbrödel/Tři oříšky pro Popelku". Do you know it? It's a wonderful, somewhat feminist adaptation of the Cinderella story and I've seen it more times than I can count, every Christmas since I was little and anything between one and four more times per year. I still do at 28. I love the Princess and the Pea but I think my favourite fairy tale is Rapunzel! Such a beautiful little pattern! How I would love to stitch it up!! My all time favorite fairy tale is Beauty and the Beast. Even as an adult, I'll take time now and then to read the story to be reminded that beauty comes from within... Have an especially blessed day! What a lovely pattern! I love that story. My favorite fairy tale is Beauty and the Beast. Still love to read that story. Love that bunny. My favorite fairy tale is "Snow White and Rose Red" from a very old children's book I have had forever. The paintings with it are gorgeous and I love the story! I've always loved Beauty and the Beast. I was a voracious reader, and it gave me hope that a bookish girl could find her prince- and I did! I like to tease my husband that he's like the Princess and the Pea, though, since he's always got his cell phone under his pillow or he can't sleep! I'm a bit confused about the dates - am I too late? I loved Rapunzel as a girl, I always wanted her hair! Congratulations on the anniversary, it's a beautiful pattern. Super cute pattern. My daughters adore fairy tales. Congrats on the anniversary! Ah, sprookjes... ik denk dat De stuk gedanste schoentjes mijn favoriet is. Lovely pattern. I always loved Alice in wonderland! Ooh, how exciting! Congrats on reaching three years. My favourite fairytale would have to be Little Red Riding Hood, mainly because it's my sweet little daughter's favourite and i love snuggling up in her bed while we read it together. I always liked reading and watching Cinderella. Loved the happy ending. Happy Anniversary with your pattern which is very cute. Fairy Tales, huh? I don't know if I really have a favorite. I relate fairy tales to Disney movies so on that, I love Beauty and the Beast. Otherwise I really like Rapunzel and Little Red Riding Hood. I have the Princess and the Pea, you posted a picture I sent of a quilt I made with it as the center a couple (?) years ago. Would love the chance to get another pattern. I've always loved this pattern! My favorite tale is Cinderella. I remember going to girl scout camp and my mom let me bring two books. I brought Cinderella and The Hydronaut Adventures. Those don't really go together do they?